Choose from MAGNETIZED frames or standard frames, which come with plastic frame connectors. 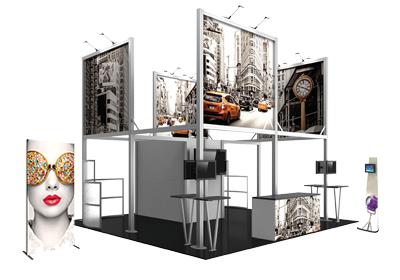 Modulate™ is a versatile, reconfigurable exhibit system. 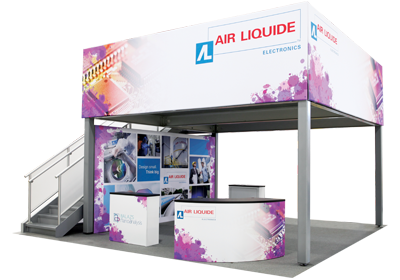 Modulate pre-defined 10ft wide inline kits can reconfigure easily as individual banners with no extra parts, pieces or packaging. Modulate kits are comprised of various aluminum tube frame banners with unique curves, shapes and corners. Frames feature printed pillowcase fabric graphics that slip over easily and zip at the bottom. Choose from magnetic frames or standard frames with linking clips that connect the frames together at a 180-degree angle. Universal feet connect the tube frames at the bottom. Displays come in durable, portable carry bags and optional expandable cases are available as an upgrade.